Brewing Recipes On The Go? Have you ever wanted to toy with your favorite beer recipes on the road? I’ve spent the better part of the last two years making that dream a reality. This week I present a short preview of upcoming BeerSmith Mobile which brings recipe editing to your phone or tablet. BeerSmith Mobile follows our earlier release of BeerSmith Lite, but offers a greatly expanded capability. BeerSmith mobile brings you full recipe editing. You can add new ingredients, alter your mash schedule and run the brewday timer all from your phone or mobile device. It also has the ability to create new recipes on your mobile device. It will be available for the iPhone, iPad, Android, Android Tablet and Kindle Fire operating systems. Using your free BeerSmithRecipes.com account, you can drop a recipe in the cloud folder on your desktop version of BeerSmith, head out the door and edit it from your phone or iPad. 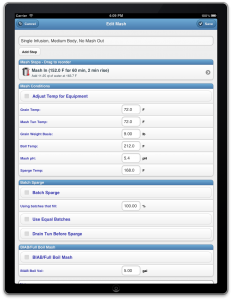 Your profile data (equipment, mash profiles, fermentation profiles) can be saved from your cloud recipes to your mobile device to make it easy to get started using your equipment setup or favorite mash schedule. Ingredients can also be saved from any recipe so its easy to add ingredients. Click on the edit button to open any recipe for editing. BeerSmith mobile shows the color of the beer as well as a style guide comparison that are updated as you edit. You can easily add new ingredients from the pre-loaded list of ingredients at the click of a button. The full BJCP style guide is also included for building new recipes. I’ve also included functions to change the original gravity, bitterness or color levels easily just like you can on the desktop version. 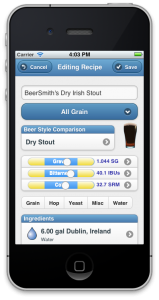 BeerSmith mobile even includes the scale recipe command which can scale a recipe to match a different set of equipment all in one step. You can save recipe profiles or ingredients from any recipe including those you have transferred from your desktop and fully edit them in BeerSmith mobile. Just view the recipe (don’t edit) and view the item you want to add, then save that item. You can also fully edit any of these profiles or ingredients. This lets you adjust your equipment losses, edit a mash profile or add a new ingredient on the fly. BeerSmith mobile includes the full brew day timer for both mash and boil phases, so you can drop a recipe into your cloud folder on your desktop, walk to the garage and start the timer from your mobile device. Alarms are played as you reach new steps such as mash step changes or boil ingredient additions. 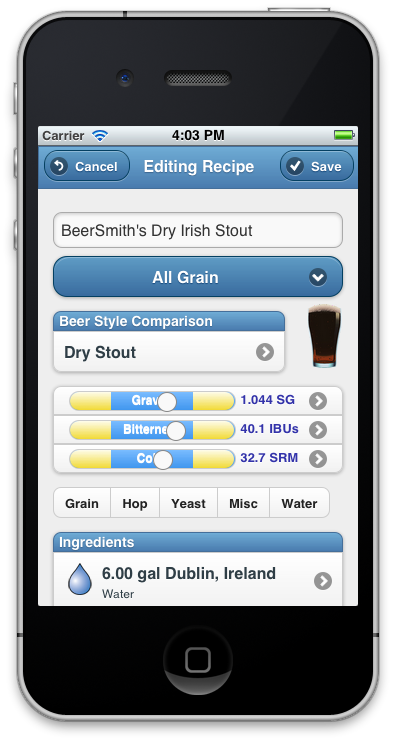 BeerSmith mobile also includes an area for entry of session data and editable notes, so you can record critical volumes, gravities or notes as you brew and have them stored in your recipe for future reference. The BeerSmith app also includes a suite of 7 handy brewing tools for common functions like determining alcohol content, converting a refractometer reading or adjusting your mash temperature. I added unit converters for volume, weights, temperature, and OG to perform those functions. I’ve set an Android release date of 1 May 2013, and will release the iPhone/iPad version approximately two weeks after that (pending app store approval). I’m planning to offer it for a limited introductory price of $7.99 until the end of June. After that the price will rise to $9.99. BeerSmith mobile will initially be offered as a separate application (from Lite) in the Google Play, Apple and Kindle app stores. I am actively looking at the various “in-app” purchase options as well and hope to offer an “in-app” purchase upgrade for users of “BeerSmith Lite” to upgrade to BeerSmith Mobile in place, but expect it will be a month or two after the launch before I can complete and test these options. In this case, the in-app purchase will let you add the full mobile functionality to your existing BeerSmith Lite for the difference in purchase price. Updates and the launch announcement will be sent for all platforms to my newsletter list – so join it today! Hi, I’m really looking forward to this app! Just one thing, in BSLite you can’t use “international” characters, like åäöü and so on, it shows up weird, will this be “fixed” in this version? It’s not a huge deal, just slightly annoying… Keep up the fantastic work! Looks awesome! That second to last bullet – upgrades from BS Lite – does this mean there will be no upgrade option until you’ve sorted the in-app option out? So pay $7.99 if you want it now, or “wait until I sort this out” if you want to upgrade? I understand that an in-place upgrade won’t be available, just curios if it will be via some other method. Awesome, I look forward to upgrading. Thanks, I’m very excited about the new Full Version App. I currently have the Lite version and you did address some concerns in your post, I have another question. Since the In-App upgrade won’t be available for another month or two after the release, we will be unable to take advantage of the reduced introductory $7.99 price. I understand the Lite owners will have to pay an incremental price, rather than full price, but will we be paying the difference to $7.99 or to $9.99? Since we were early adopters of your Lite app I don’t think we should be penalized and have to pay the incremental of the $9.99 price. Please confirm your intentions. 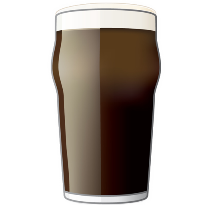 Does the new version have the ability to export xml recipes from BeerSmith and import in to the mobile version without using the cloud service? This is a key feature that is needed. Any intention to add inventory management to the mobile applications? That is one of the major features keeping me from jumping in. Will you be charging for this app for users who have already purchased the desktop software? If so, will you have a “free trial” available like you do for the desktop version? I don’t see the justification for purchasing the software twice when I can just install it on my laptop for mobility purposes. Yes it will be a separate purchase. I have no way to offer a discount via the app stores – they are all set up to be fixed price. I do not have inventory in the system yet, but I’m looking at adding it in the future. Unfortunately I have no upgrade option (other than purchasing the full version separately) until I can get the in-app purchase sorted out. The app stores don’t let me offer a discount based on ownership of another app so I’m working through the only option available. Nick – Once I get the “in app” upgrade options working I’ll try setting them at the discount for at least a month to allow people a chance to get the discount before I go to the higher price. I’m excited for this! I mean very excited for this. I have BS Desktop, Lite, and now I’ll be buying the Mobile app. The way I see it if I pay $7.99 now it about evens out for the cost I paid for BS lite anyway, minus the $9.99….well it’s a dollar difference and if a dollar is the deal breaker for you, more power to you. I don’t know if I personally would want to use this on my Iphone, because of the small screen. But I’ll use it on my Kindle for sure. I can understand the one user who doesn’t want to pay for it for phone use because he has it on his laptop, but I tend not to bring a laptop with me to homebrew club meetings or places like that, but I usually have my Kindle. So it will be handy to tinker around with recipes at those times, and in my opinion worth the $8. My question is that since I have BS lite, when I purchase the full app will my recipes transfer over from BS Lite to BS Mobile or will I have to manually transfer them all over again from my Desktop application? Not a major deal, but something I am curious about. What are the iOS/Android requirements… I.e. what iOS version is required? I’m thrilled for this! I have a few questions about materials: I have tons of custom materials (IE: Crystalized Ginger), can I export those into the iPhone app or will I have to retype them all? Also, you have several downloads of extra hops and grains available for the full version, will they be available in the iPhone? You can save custom ingredients or profiles from any existing recipe via the cloud – therefore if you add your ingredients to a recipe on your desktop and move it over via the cloud you can go through and save each to your mobile version. I don’t yet have the “add-ons” integrated but I’m looking to add them in a future upgrade. On Android the local recipes will be available from both Lite and the full Mobile version. On iPhone you will need to store your local recipes again due to the security (sandboxing) Apple imposes – each app on the iPhone is separate so the files are not shared across apps (except via our cloud). Brad, I’ve been using BeerSmith and BeerSmith Lite for some time now. I really like the capabilities of the program but wanted to ask if there is any intention in adding a scheduling system? I have also used iBrewmaster and I confess it’s calculations and technical reliable are flawed, however, the way they handle batches and scheduling is superb. These are two things I would love to see used in BeerSmith as it would totally render any other program useless. The ability to differentiate batches from recipies is really what opens up the scheduling system. I kind of use both programs now. BeerSmith for recipe development and storage, and iBrewmaster to keep track of batches, alterations/notes to each batch, and a scheduler linked to my fermentation schedule to keep me on track without having to add all of that separately to my personal calendar. Just wondering if you all were considering this? Hi Brad quick question,will the android app full version have the all grain to extract convertor? Looking forward to upgrade my Lite to Mobile on my Android phone Are you planning to support Windows 8 RT platform for a Microsoft tablet? I’m seriously looking at it. I downloaded some tools to start porting the other day but it is not a trivial task so it might take a month or two to get something going. No – unfortunately I have not integrated the all grain to extract converter in the mobile version due to the complexity of the code involved. It is something I might consider adding in the future. Android 2.1 or higher (it looks better on 4.0+). iPhone 5.0 or higher. Brad, there is an alternative to the in-app upgrade at least on iTunes. iTunes has coupons, you could email them to your existing “Lite” users. I’ve looked at the iTunes promo codes available but they only allow 50 to be sent out. I’ve used these for rewarding beta testers, but the 50 person limit clearly makes it “not too useful” for many hundreds of general users. Also the Google Play store offers no comparable codes. If you are aware of other coupon codes available please drop me an email as I am interested. A simple question – will one need also the desktop program in order to use the full mobile app? If I understand this right you will only be able to use recipes from beersmithrecipes.com? In other words, with a free account you’re limited to 15 recipes? Do you have any plans to support Dropbox or any other cloud-storage? How about local storage (including external SD cards)? It would be great if you could elaborate a bit more on how data will be handled. Many thanks, this is very exciting! You can create/edit new profiles, ingredients and full recipes in the full BeerSmith mobile app so technically you can create and brew recipes without the desktop version. That is not correct – BeerSmithRecipes.com is only needed for transferring or sharing recipes with the desktop version. You have the option in the mobile version to store recipes locally as well – an unlimited number (within reason). Note that these local recipes are also available offline so you can brew without an internet connection. The number of Promo codes has to be much higher than they are leading you on to believe. Companies like Starbucks hand them out like candy for free songs and now paid game apps as well. Thanks Brad! This might give my (in technological age) old Transformer tab a very good new use! I purchased the BeerSmith 2 Mobile app for my Kindle HDX6 through the Kindle app store. After installing, when I try to create my first recipe and edit the SG, IBUs, and SRM, I am unable to change them (that is, when I change the IBUs to say, 25, and hit Save, it just goes back to zero).